Ongoing research on leading B2B firms around the world recognizes the top UK & Canada agencies in the advertising, branding, public relations, digital, and pay-per-click industries. 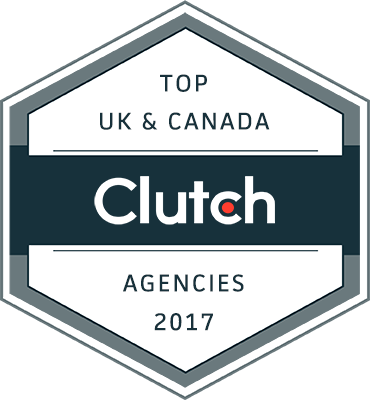 WASHINGTON, DC – September 7, 2017 – Today, Clutch issued a report announcing the best agencies in the United Kingdom & Canada in 2017. A ratings and reviews firm based in Washington, DC, Clutch’s research has expanded to identify leading B2B providers in the UK and Canada, with their latest report giving particular recognition to the top agencies specializing in advertising, branding, public relations, digital, and pay-per-click services. Advertising agencies: Kiosk, Bareface, Left Productions, Split An Atom, and Definition 6. Branding agencies: Evviva Brands, Brown Owl Creative, Beyond, Redweb, Pragmatic, Crowd, Vox, Definition 6, Series Eight, and B-Reel. Public relations firms: Red Hot Penny, twentysix, Split An Atom, Custard Online Marketing, and Shilbrook Associates. Digital agencies: Redweb, Crowd, EnVeritas Group, The SEO Works, Definition 6, Greenlight Digital, Eden Agency, twentysix, Krify Software Technologies Private Ltd., and Glance Creative Ltd.
PPC (pay-per-click) management companies: Profitable Sites, Kiosk, novi-digital, Greenlight Digital, Intalyse, Digivate, Red Hot Penny, The SEO Works, Custard Online Marketing, and Clickingmad Ltd.
Advertising agencies: Bob’s Your Uncle, Giants & Gentlemen, Havas Canada, Nova Solutions, Jablonski Marketing, talonX Creative Agency, Intrigue Media, Locomotive, and Atomic Motion. Branding agencies: Lift Interactive Inc., Havas Canada, Art & Science Digital Experience Design Inc., Zync, Mediaforce Digital Marketing Agency, Main Street Creative, Jablonksi Marketing, Locomotive, Porat Shalev & Co., York & Chapel, Box Clever, Full Blast Creative, talonX Creative Agency, Bob’s Your Uncle, and Bedouin. Public relations firms: Strategic Objectives, Viral in Nature, Full Blast Creative, and Media Launch. Digital agencies: THP, Mediaforce Digital Marketing Agency, Lift Interactive, York & Chapel, Art & Science Digital Experience Design Inc., Roketto, Full Blast Creative, Awkward Media, Forge and Smith, Atomic Motion, talonX Creative Agency, Local SEO Search, Jablonski Marketing, Box Clever, and Osellus Mobile. PPC (pay-per-click) management companies: ClientFlo, Top Draw, Mediaforce Digital Marketing Agency, Art & Science Digital Experience Design Inc., Cheeky Monkey Media Inc., Roketto, BlueHat Marketing, Full Blast Creative, seoplus+, Nova Solutions, Awkward Media, DMG Online Marketing, Academic Ads, First Page SEO, and 1st on the List Promotion. Clutch’s research is ongoing. All firms interested in being featured in the research are encouraged to apply through the Clutch website. Upcoming press releases will highlight global industry leaders.